If we sleep normally, we go through five sleep cycles of varying depth. The very first stage, the period of time where we try to get to sleep, is called hypnagogia. 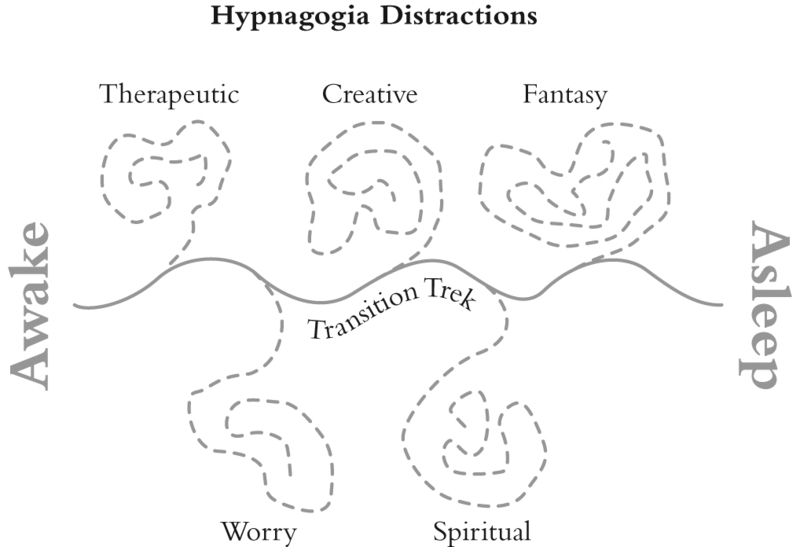 Hypnagogia is also called “sleep onset.” At the end of each cycle, we ascend and enter a state called REM (for rapid eye movement) where we dream. After REM, we may not go back to sleep and instead actually wake up. If we do wake, we have to try to get back to sleep again, and this involves going through hypnagogia once more. 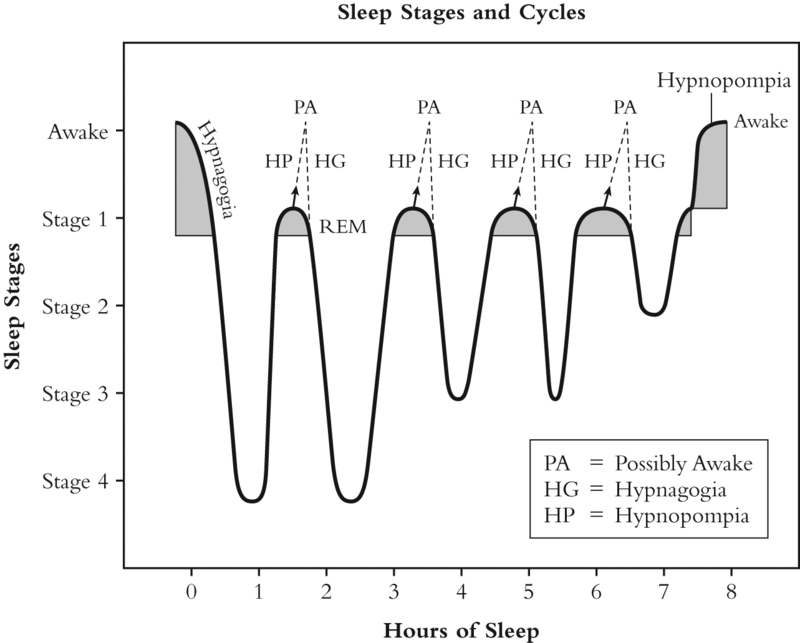 So, we have five chances to mess up a good night’s sleep by not successfully negotiating hypnagogia. Each of these types of distractions can pull you off the beaten path to sleep. They are described in detail in In Pursuit of Sleep, pages 22-26. The way to avoid them and find your way to sleep is to use the Transition Trek, also shown in Figure 3-1, which is described in detail in Chapter 4. The Transition Trek is a detailed thought control technique, one that directs your mind toward sleep. So, now hopefully, you can see why I don’t have a lot of faith in sleep hygiene. It doesn’t address what actually happens when you close your eyes. Well, that may not actually be entirely true. If you have a lot of things going through your mind, they attribute them to stress and recommend you see a psychotherapist. They don’t recognize the fact that many of these thoughts are due to creative impulses, fantasies, and perfectly reasonable worries, among other things, that should not have to be address by a therapist. All you really need is a reliable thought control technique that directs you away from these disrupting thoughts and toward sleep. You should not need medication either. All that is presented in In Pursuit of Sleep. It should be all you ever need.